Over the many years that air travel has been around, passengers have had to get creative in ways to entertain themselves on flights – especially those lasting for hours. While my go-to way to spend time is instantly falling asleep, this isn't always an option. For those passengers who have trouble falling asleep on planes, things have gotten a lot better as entertainment options have come a long way in recent years. From seat-back options to wifi connectivity for personal devices, passengers can enjoyably sit through an entire flight without having to stockpile books and crossword puzzles from Hudson News before they board. Depending on whether a flight is short or long, entertainment options of choice tend to change a bit. On shorter flights, you're less likely to be on a plane equipped with as many amenities as a longer haul so an option like watching a movie depends on what a passenger is able or willing to bring on board with them. I was pleased to discover that a good portion of people, like me, choose to spend their flights asleep. And yes, I am classifying sleep as entertainment because dreams are fun. 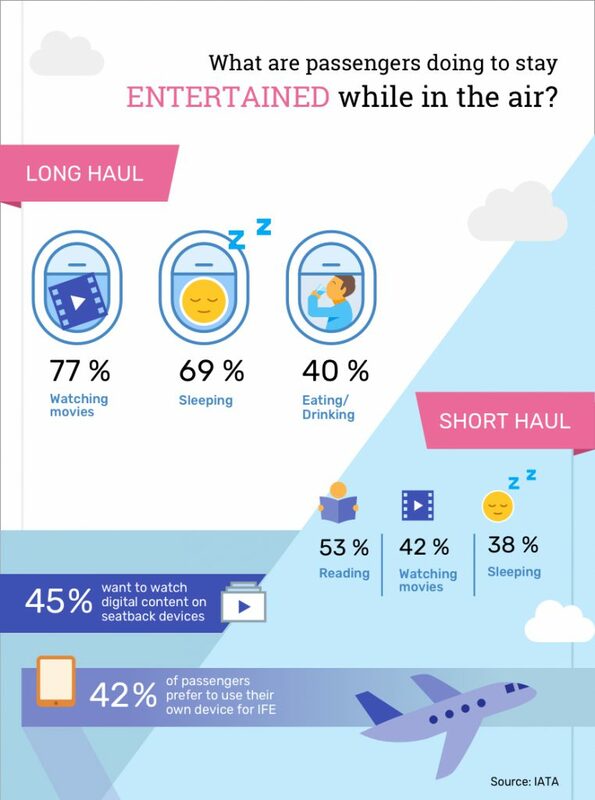 It's interesting that people are much more likely to read on short haul flights than long haul, but this may have to do with technological limitations like how short haul planes may not have seat-back options or how electronic devices sometimes have limitations on when you can take them out, cutting into movie watching time on an already short flight. When people do watch movies, the preferred venue is through onboard IFE devices rather than a personal device but not by much. As onboard wifi and streaming services become more widespread and powerful, it wouldn't be surprising if personal devices soon surpassed seatbacks for the preferred choice.